Maybe not as true of a feel for the backboard as one of the reinforced backboard models of Goalrilla, but that’s the trade-off for the Clear View. 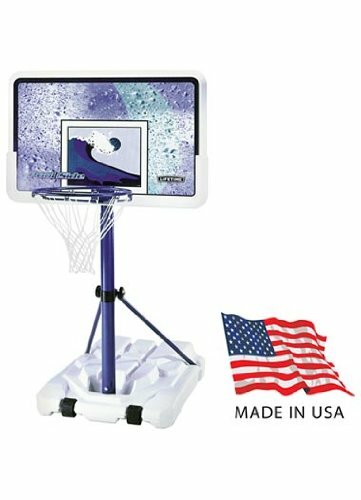 The CV54 (model B3103) is the clear view backboard in the 54″ lineup for Goalrilla, giving you that clean, professional look in the backboard, without any supports blocking your line of shot. A great looking all around goal and a great choice for anyone looking at a 54″ goal. Goalrilla produces an extensive line of premium basketball goals, and has been in business since 1991. The CV54 features a 3/8 thick, 54″ tempered glass backboard a a 5″ one-piece square pole. The backboard overhang is 3 feet. The height adjusts infinitely from 7.5 – 10 feet with the use of a crank handle mechanism. Included is a heavy-weight pro-style flex rim and an anchor bolt mounting system. The frame is Dupont powder coated to provide resistance against corrosion and UV rays. Just like every Goalrilla, the CV54 is backed by a lifetime warranty. All the padding that comes with the goal and the clearview backboard. Stronger rim that comes with it. The quality, the price, the warranty. 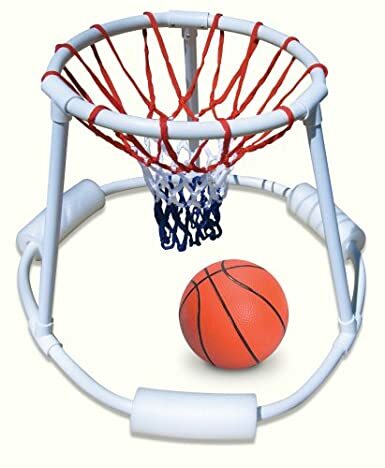 I like the fact that Goalrilla basketball goals have been around so long. If I have a warranty issue they will still be there for me to call them years down the road. Also shows that with them being around so long that they are a good basketball goal and a stable company. I purchased this online so this made me feel more at ease with my purchase. Even though it is only a 54” backboard it is still a Goalrilla basketball system. It has a one piece post and adjusts lower for my younger children. I only have a small driveway and was not wanting anything too big that would look huge and overbearing. This was the perfect size backboard and I feel I did not have to sacrifice quality because of it. I like the fact that their is nothing showing behind the board to distract you playing. It also came with the padding around the bottom of the backboard and a pole pad. I have a lot of neighbors around the neighborhood that have these systems and they still look good. Assembly is pretty easy but the instructions are a little off on the amount of concrete it says is needed, so buy extra concrete. My husband was able to install it with just a couple of his friends which saved us money. Small backboard compared to what my kids play on in school. I wish it went lower for my small children to play on easier. It is curbside shipping and the truck driver does not help you out. They schedule an appointment with a 2-3 hour time frame so I had to take time off of work and have someone with me because I could not lift all of the boxes on my own. The goal is great, but the shipping/delivery could be better. The lowest height is not low enough for my younger kids to shoot on. I also would like for the goal to drop lower for my younger children to be able to make a basket. The shipping process is not easy, it would be nice if they could take it to your garage or even if the truck driver could help with boxes. For a more comprehensive, in-depth review, visit the Basketball Goal Store. Heavy assembly but worth it. 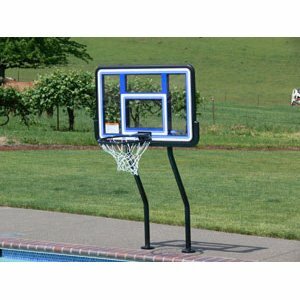 The Goalrilla CV72 (model B3101) is an AWESOME basketball goal. It features a regulation size 72″x42″ tempered glass backboard, a 6″ x 8” thick one piece square pole, and a 4 foot overhang. The installation involves using anchor bolts so it can go with you if you move. Included is a pro-style flex rim, and height adjustment from 7.5 – 10 feet. The system is powder coated to protect against UV and corrosion. Goalrilla backs the CV72 with a limited lifetime warranty. Stable. With a 6″ x 8” thick square pole and a 72″ tempered glass backboard, the CV72 takes basketball goals to the extreme. Miniscule vibration occurs when shooting. 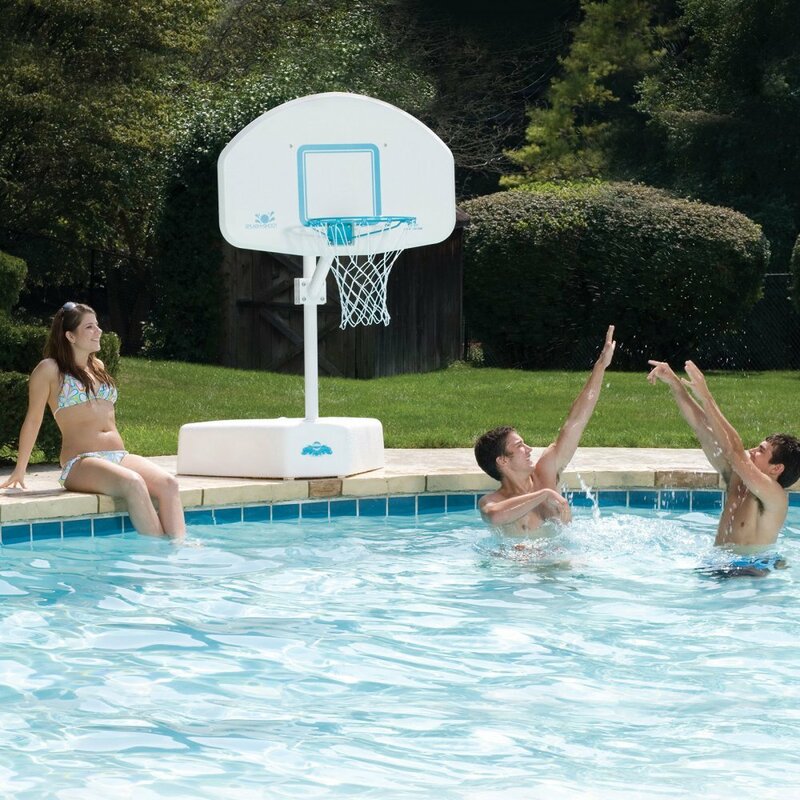 Your biggest friends can dunk on this goal! Crank adjust. Precise and reliable, the crank adjust is the best out there. You simply turn the handle to raise or lower it. This is one heavy backboard but the adjustment handle adjusts it easily. 72″ tempered glass clear-view backboard. It’s regulation size, and the tempered glass is exactly what is used in the pros. It’s very heavy, which makes it rigid and performs better than any other type of material. This size is ideal for a backyard basketball court, though a 3 car or more driveway would be suitable as well. At 1/2″, it’s as thick as a NBA backboard. Pro-style rim. 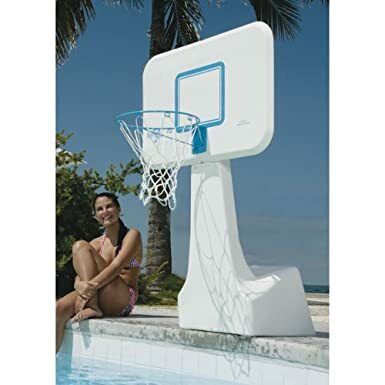 It can handle big time dunking but the backboard has that touch you’re used to playing on at the gym, 4 foot overhang. A 4 foot overhang is about as big as it gets for residential hoops. Some might go to 5 feet, but this provides ample room for play underneath and behind the basket but doesn’t encroach into the driveway. Also, players can easily avoid running into the pole or tripping over it. 1-piece 6″ x 8” square pole. This is a huge piece of steel! 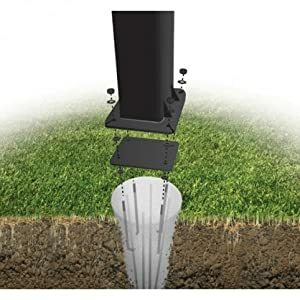 This post eliminates any wobble you might find on a smaller post or a two-piece design. The thicker the pole, the better it plays. Anchor mount installation. If you ever move you can take this goal with you to your new home. There is no reason to ever have to buy another goal. This really will be the last goal you ever buy. Heavy assembly. This goal is HEAVY! The post is massive. The backboard is thick! You will definitely want to have some friends or neighbors help you stand this goal up if you do it yourself. Trust me, it’s worth it! If you need to move or relocate this Goalrilla Basketball Hoop System, you will need a new anchor system. This basketball hoop is very easy to unbolt and reassemble wherever you want to move it. 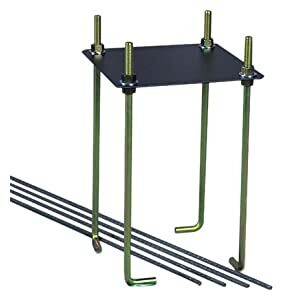 The system comes with an anchor set, however, if you ever need to move it, you can buy an additional anchor set the Basketball Goal Store. The Goalrilla CV72 is an awesome system. 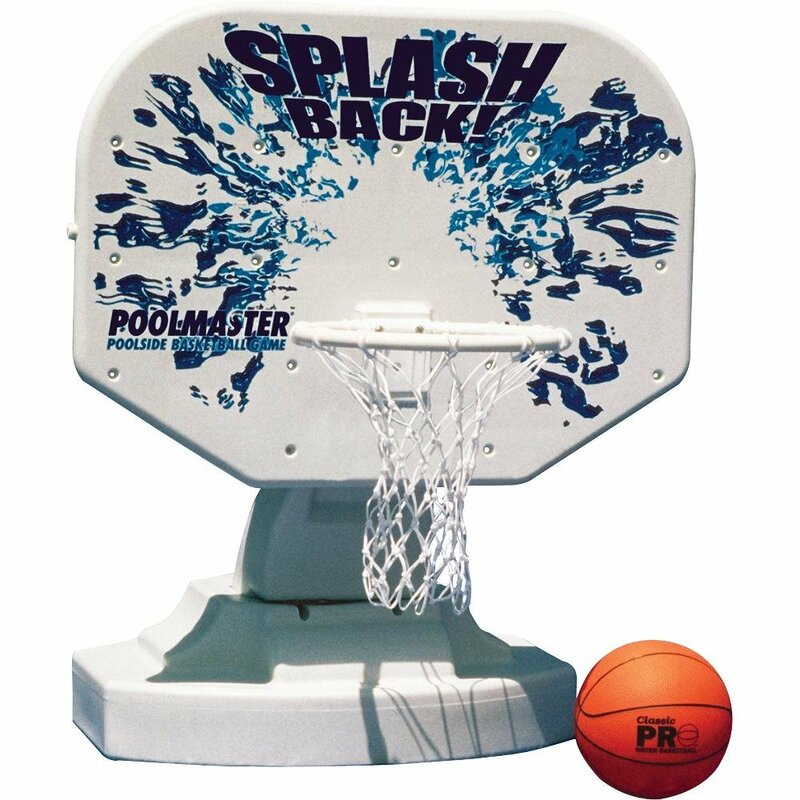 It has all the features that you look for in a premium basketball system: a regulation size backboard, a thick pole, a 4 foot overhang, a pro-style rim, and anchor mount installation. The assembly is going to be heavy and takes some muscle to stand up. This system includes a universal pole pad and a backboard pad. The only thing anyone needs to add is a basketball! For another CV72 review, please visit the Basketball Goal Store. Cheapest place I found to buy it was at http://basketballgoalstore.com.